On your way to a more attractive smile, you’ll have to deal with some inconveniences while wearing braces like avoiding certain foods or habits or dealing with possible embarrassment about your new “metal smile.” But there’s one consequence of wearing braces that could dramatically affect your dental health: the difficulty they pose for keeping your teeth clean of dental plaque. Dental plaque is a thin film of bacteria and food particles that if allowed to build up on tooth surfaces could trigger tooth decay or periodontal (gum) disease. Brushing and flossing thoroughly every day helps prevent this buildup. Unfortunately, metal brackets and wires can get in the way and cause you to miss areas while performing these hygiene tasks. This could cause plaque buildup in those isolated areas that could trigger an infection. And if you (or someone you love) are also a teenager, the natural adolescent surge in hormones can increase your infection risk. If while wearing braces you notice your gums are reddened, swollen or bleeding when you brush, these are all signs of infection and the body’s inflammatory response to it. The longer the infection continues, the weaker the tissues become, causing them to gradually detach from the teeth. Along with bone deterioration (another effect of the disease), this can ultimately lead to tooth loss. To prevent this from happening, you’ll need to be as thorough as possible with daily brushing and flossing. To help make it easier, you can use special tools like an interproximal brush that can maneuver around the braces better than a regular brush. For flossing you can use a floss threader to more readily guide floss between teeth or a water flosser that uses a pressurized stream of water rather than floss thread to remove plaque. This extra cleaning effort while wearing braces can greatly reduce your disease risk. But you’ll still need to keep an eye out for any symptoms like swollen or bleeding gums, and see your dentist as soon as possible. 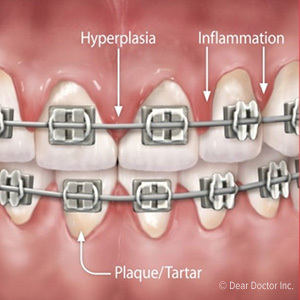 If the symptoms become severe you may need your braces removed until the disease can be brought under control. The health and future vitality of your teeth and gums is what’s of primary importance. Why Proper Dental Hygiene is Important? Drs. Feck, Combs and Wilson have trained with some of the world's most prominent Sedation Dental Specialists. They are members of the Dental Organization for Conscious Sedation. They are rapidly becoming known as Lexington Area's leading dentist for people who want to relax through their dental treatment.